I don’t always have an idea or inspiration when I sit down to paint. Once I’m there at the table it’s rare I spend more than a minute or two coming up with an idea. I usually start with doodles in my sketchbook and then move on to paintings that are in progress. I’m in a good routine of sitting down most mornings right after the kids go to school before anything else starts. I’m so excited for spring and for flowers, so I’ve been painting from the Burpee catalog. I always listen to a podcast while I work. One of my new favorites is Etsy Conversations. What’s your creative routine? Have you visited my Etsy shop yet? There’s printables for each holiday, invitations, and even digital gifts! Categories: Inspiration, Sketch, Watercolor | Tags: creative, creative inspiration, morning, painting flowers, routine, watercolor | Permalink. 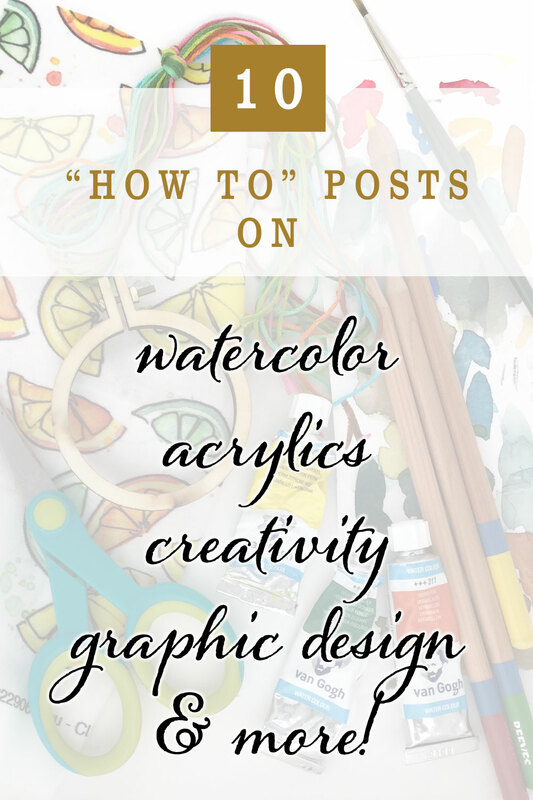 10 “How to” Posts on Painting, Graphic Design, Creativity and more! It’s still amazing to me that I made a commitment to be creative, created this blog to hold myself accountable, have continued with it for over five years, and have published over 600 posts! This from someone who previously couldn’t finish a creative project. Here’s a round up of my best “How to” posts. How to Design Invitations. I’ve been a Graphic Designer for over 20 years. I wrote this post to share the process of designing invitations. Designing invites has always been one of my favorite projects. 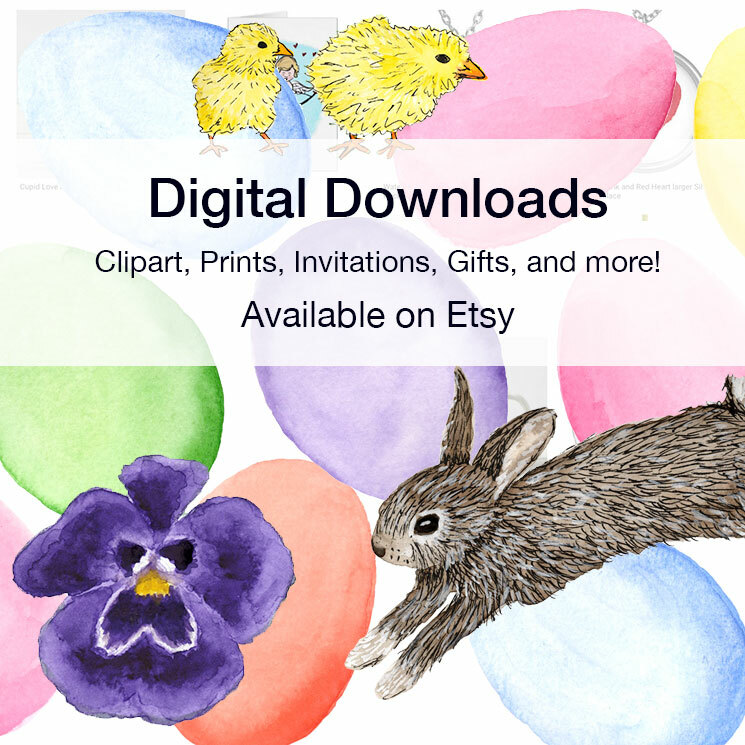 Visit my Etsy shop for invitation borders, backgrounds, and clipart that make the invitation design process easier! How to Paint the Ocean. For the last few years I have dedicated myself to capturing the ocean in watercolor. This post shares my step by step process and my secret ingredient. Transitioning from Watercolor to Acrylics was such a challenge and I’m still learning every time I pull out a canvas. In this post I share the top differences between the two, to help others make a more smooth transition. Easy Forest Watercolor Project – is a great one for watercolor beginners. Create an interesting forest and learn and practice five watercolor techniques along the way. It’s actually one of my most popular posts and I’ve heard such nice things from the people who have tried it. There was even a group at a library that tried it. Creating Repeating Patterns. Early on in my blogging days I began noticing the art of Surface Design. This post explains how to turn your art into a repeating pattern. Creativity is for everyone. For me being creative is less about the final product and more about the joy I get from being creative. I wish I realized sooner that talent doesn’t mean much. It’s just a starting point. If you have the desire to be creative and work at it regularly, your skills will improve. Winter Birch Tree Painting. I wanted to add wintery art to my living room so I created these birch tree paintings in acrylic and shared my process in this post. Developing your own Illustration Style. When my kids were small I desperately wanted to illustrate a children’s book. But, not only were my skills not there, but I didn’t have a style. I scoured the internet looking for ways to develop my own style. In this post I share what I learned. Ways to Find Inspiration. It’s very rare that I don’t have ideas. For me time is more of a struggle, as well as following through on ideas. This post shares ways to find inspiration. Logo Design Process. I shared a peek into my life as a graphic designer in this post about designing logo. Want a dose of creative inspiration? Sign up for my newsletter -“My Creative Collection.” A collection of all the things that inspire me, in the hopes of inspiring you! Sign up here! Categories: Acrylic, creative habits, Gouache, how to, Illustration, invitations, Patterns/Surface Design, Watercolor | Tags: acrylic, creative practice, creativity, Design, diy, graphic design, how to, paint, tips, tutorial, watercolor | Permalink. 2019 is off to a good start! I’m making drawing and painting a priority and try to work in the mornings, even if it’s just for a little bit. It’s fun to sit down with no real thought as to where it will lead and let things unfold. With painting holiday themed things throughout December, it’s been a while since I painted a seascape. Looking through my stack of unfinished projects, I found the start of a seascape and suddenly felt inspired to finish it. (Our annual New Year’s Day walk at the beach may have also inspired this. The waves were crazy!) Painting the foam was so much fun! to here: The secret is a lot of white gouache! 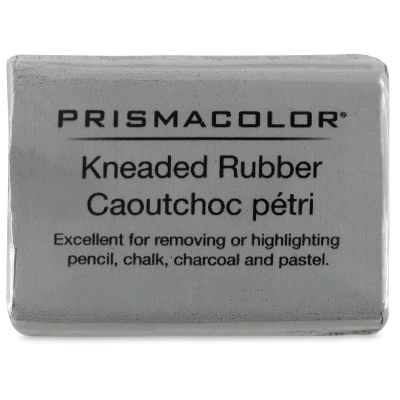 As I was looking through my supplies this week, my kneaded eraser was nowhere to be found, I had only one sheet of watercolor paper left, and my favorite sketchbook was running low! I didn’t paint today but I did head to Blick to stock up on these essentials. I usually paint using 9” x 12” or 12” x 12” watercolor paper, but felt inspired to also grab a larger pad of 12″ x 16″. It’s funny – a few years ago my favorite size was 6” x 6” – so small! It was an accident that I went to the 12” x 12”. I ordered the wrong size, decided to give it a try, and have never looked back! 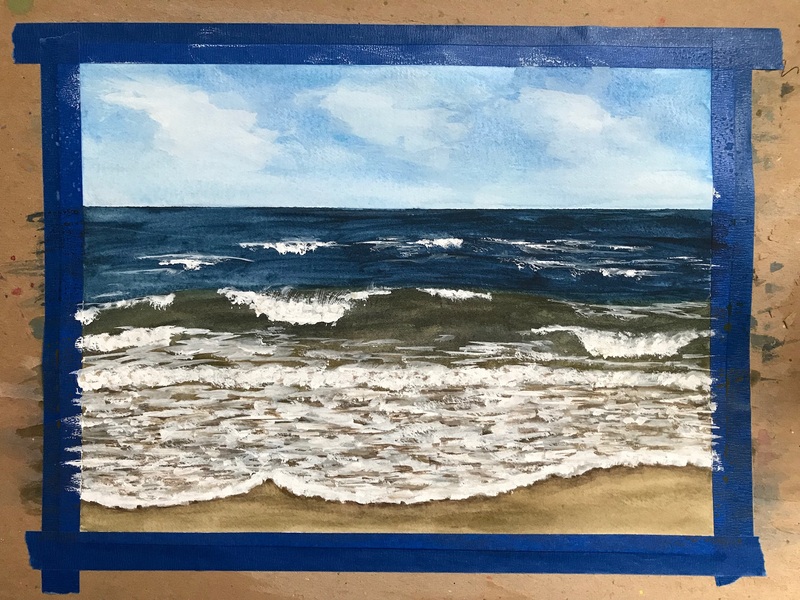 Categories: Gouache, painting the beach, Products I Love, Watercolor | Tags: 2019, creative, creativity, painting, Seascapes, watercolor | Permalink. Kick up your Creativity with Color! Want to be creative but don’t know how/where to start? If you haven’t already, click here and start with these 3 steps! If you have started with the beginning 3 steps, then you’ve accomplished a lot! Your eyes are open to inspiration. You take photos and make lists of things to sketch. You’ve been sketching regularly in pencil. Hopefully noticing the difference between the softer B and the harder H pencils. You have a regular creative practice! You don’t just draw something once – you practice drawing it several times. Take a moment to look through your sketches and see overall how much you’ve progressed! Well done. When you are ready, move on to these steps – that are all about Color! 1. Colored Pencil or Watercolor? – The next logical step may seem to be colored pencils, but if you are itching to paint, and want something more fluid, I recommend watercolor. Here is where YOU decide what path your creative journey takes. This is about finding what YOU like. If you need recommendations on either see below. 2. Start simply with your sketchbook. Continue with your creative habit of sketching regularly – but now use color! You can use regular pencil first and then add color – or start directly with color. I recommend working in your sketchbook because it’s a no pressure, play zone, where you can practice and learn. 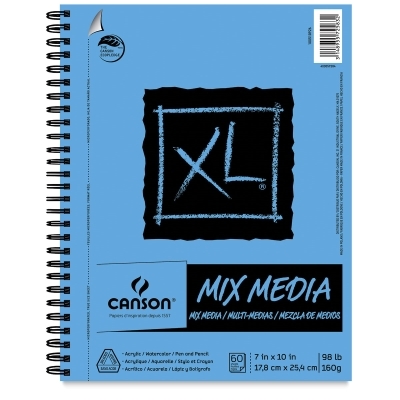 Note: if you decide to use watercolor – please look at my sketchbook recommendation below, so your pages don’t buckle. 3. Beyond the sketch. After practicing in your sketchbook, it’s time for a drawing or painting that you spend more time on. After all your loose, quick sketches, you are ready. It can be a page in your sketchbook, or perhaps use a nicer paper – see recommendations below based on your choice of medium. Before you start, plan it out. Pick a reference photo, study it, and lightly plan it out in pencil. When you are working on a drawing or painting for a longer period of time, stepping away and coming back to it with fresh eyes, helps a lot. I sometimes work with my reference photo and paper upside down – to check that things look right. Don’t expect immediate results. Don’t give up because it isn’t looking like you envision. I used to be a “quitter,” but I learned that it takes time, and the results often surprise me if I stick with it, and work through “mistakes.” In the end, any “weak” areas – are just things to work on for the next time. It’s a learning process. Good Luck! Strathmore Bristol Vellum Pad – Smooth thicker, bright white paper – great for a colored pencil project. 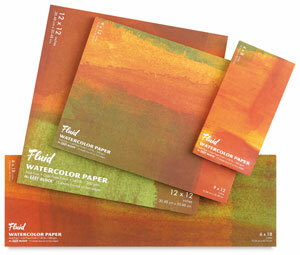 Fluid Watercolor Paper – great for a watercolor painting. Tape down the sides to a larger piece of cardboard with painter’s tape to prevent buckling! Colored Pastels are another option. I never really got the hang of them, but my daughter loves them. She uses the Prismacolor sticks. Categories: Colored Pencil, creative habits, Inspiration, Resolution, Watercolor | Tags: art supplies, color, colored pencils, creative, creativity, paints, sketchbook, watercolor | Permalink. After a busy time, it feels good to be playing around with watercolor again. When I haven’t painted in a while it feels easier to dip my toe in by working in my sketchbook. At first I don’t know what to paint so I just doodle and play around. Usually inspiration strikes. I started painting a series of mini seascapes. I’m practicing for a workshop I’m teaching next week. July is World Watercolor Month – learn more here. 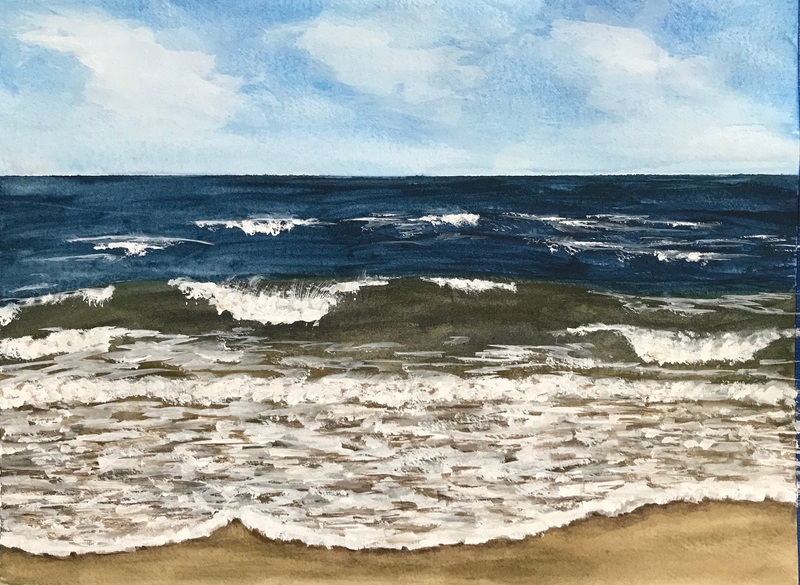 Categories: painting the beach, Sketch, Watercolor | Tags: Seascapes, sketchbook, watercolor, World Watercolor Month, Worldwatercolormonth | Permalink. The beach has been the backdrop of my life. It’s where I was born and raised, played, worked as a lifeguard…and now enjoy summer days with my family. I spend a lot of time learning and practicing capturing the ocean in watercolor. 1. Reference photo. I always work from a photo. I have the luxury of taking my own ocean photos, but even if you can’t, there are plenty of photos online to use as reference. 2. Tape your paper to a board. My favorite paper is Fluid watercolor blocks. I use the cardboard back of an old, larger pad and painter’s tape. 3. Tape your horizon line. To ensure a straight line I tape it. I eyeball how much from the photo and measure and mark with pencil both sides of my paper so it’s straight. Put the tape above your marks. 4. Mix your colors. I use ultramarine, cadmium red, and cadmium yellow and mix them to achieve the different shades of the ocean. Since the ocean is many different colors I find this to be the best way to achieve the natural looking colors I’m looking for. The color of the distant ocean is usually bluer, the waves that are closer are greener, and underneath the foam is brown water. Very wet sand reflects the sky and has a bluish tint. As the sand gets further from the ocean (and is drier), it is lighter. 5. The first layer. I paint with a brush, wet with paint, onto dry paper. I start at the horizon with a bluer mix for the distant ocean and switch to a greener mix for closer waves. For the underneath of the foam of the crashing wave I add a little grey (made from my mix of blue, red, and yellow) and light greens. In front of the wave, I use a browner blue mix and closer to the shore, where the foam is, I use a brown mix. The sand closes to the water’s edge is darkest. From there I lighten the brown (make more translucent) with water for the drier sand. I cover most of the paper. Let your first layer dry. The first layer often looks like a blob – don’t be discouraged! Watercolor is all about building up the layers and nothing is really permanent. You can manipulate and even erase the paint (by touching it with a wet brush and blotting the brush on a paper towel). 6. Adjusting the first layer – If your first layer is a bit washed out, add more paint to darken it. Use your photo as your guide. You can use this time to add darks and lights in the distant ocean, as well as within the wave in the foreground. If your first layer is very dark, you can use a wet brush to pull up some of the paint, to create highlights. 7. The sky. When your ocean at the horizon is completely dry, gently peel up the tape. The simplest way to paint the sky is to start at the top of the painting (I always turn it clockwise to paint the sky). Paint with a brush saturated with cerulean blue at the top of the painting (on your right if you turned it). Test the saturation of cerulean blue on a scrap of paper before touching your painting. Paint a few thick strokes, then dip your brush into your water, and paint another few strokes touching your first one. 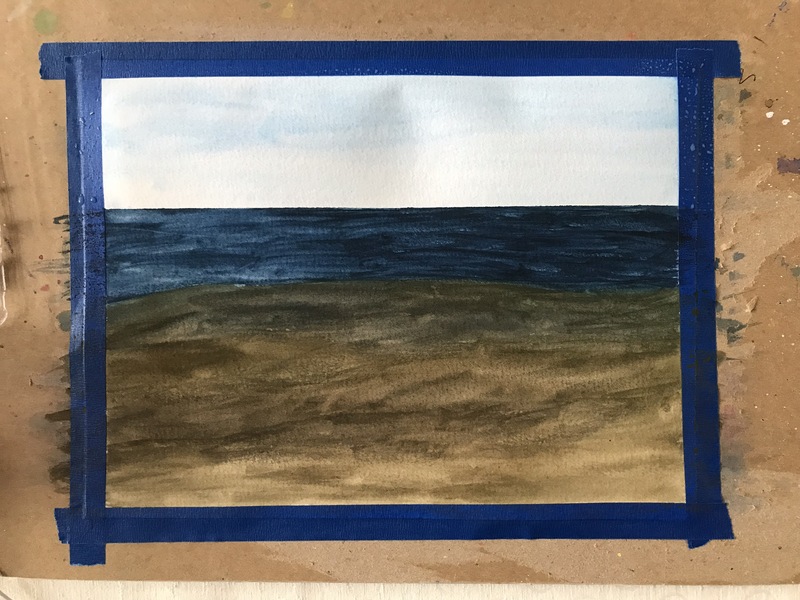 Paint to horizon line, dipping in water again if needed. You are watering down the paint as you get closer to the horizon line. The sky is lighter at the horizon and more saturated as you look up from there. Read this post if you want to explore painting more complex skies. 8. The foam – White gouache. Add the foam in the break of the wave and closer to the shore with white gouache. Gouache is more opaque than watercolor so you can paint with white over other colors. Use a flat brush and create overlapping horizontal zig zag lines for the foam close to shore. The flat brushes I use are: 1/8″, 1/2″, 3/4″. In the breaking wave use different techniques – with a round brush paint circular strokes, and paint small dots or specks (stippling). 9+. Adding details. Compare your painting to your reference photo. They do not need to be exact! What areas need more detail, highlights, shadows, or color changes, etc.? This can involve several additional layers, with drying time in between, or just one or two. It all depends on the look you are going for – how loose, how realistic. In the foam: I usually add more shadows (with dark brown or grey) within the foam, and blend it with the gouache, and more white gouache zig zag strokes on top of that. In the crashing wave: There is a lot of depth in a crashing wave. I usually add shadows on top of the gouache and then add more gouache on top of that. Add little white dots for spray. I sometimes pat my finger on top of these so they look more natural. Depending on my reference photo, I may need to paint on the barrel of the wave (with a mostly dry brush). I usually add darker areas in the water in front of the breaking wave. Distant ocean: If needed – dark and light areas for forming waves, and moving water. Dark sand at the ocean’s edge: Right next to the edge of the water add a dark line of brown. Then go back with a wet brush and touch the line to “bleed” the brown. Add more paint to the wet area if necessary to create more wet sand. Calling it done! I usually work on a painting on and off for about a week. When I think it is close to being done, I prop it up and look at it from across the room. I may add a few more details. Sometimes it’s better to call it done, because tweaking it, may affect other areas. I’ll remember the “challenges” with a painting and try to overcome them in the next painting. I’d love to see YOUR seascape! Email me at lidesigner@yahoo.com. View my collection of watercolor seascapes here. Prints are available on watercolor paper or canvas, in many sizes. Categories: Watercolor | Tags: gouache, how to, ocean, Ocean painting, painting, Seascape, tips, tutorial, watercolor, Waves | Permalink. Final acrylic work for week 1. I’m happy with the results and learned a lot this week as I try painting in acrylic after working for so long in watercolor. Admittedly, the first day in my acrylic challenge was frustrating. Have lots of rags handy! Mixing in a little water helped. Paint went on smoothly. When I want to create a fade in watercolor, I apply the color and then use water to fade it out. Doing this in acrylic, adding too much water, creates a strange look and I worry it will rub off. Overall, I was proud of my progress on Day 2. Fading colors. This video was very helpful regarding fading:. How much is too much water? This video answered my question on mixing in water. 80% paint, 20% water max. 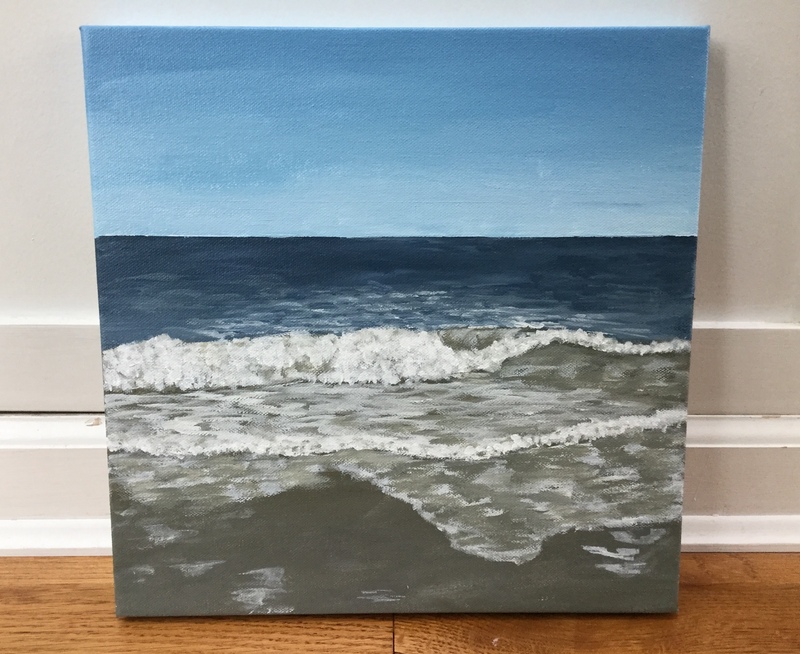 I’m still trying to figure out the right color mixes, especially sand, which is ironic because back at the beginning of my blog (2014), I was painting in acrylic and trying to figure out what color sand is! Overall I’m happy with my progress and am looking forward to learning more next week! 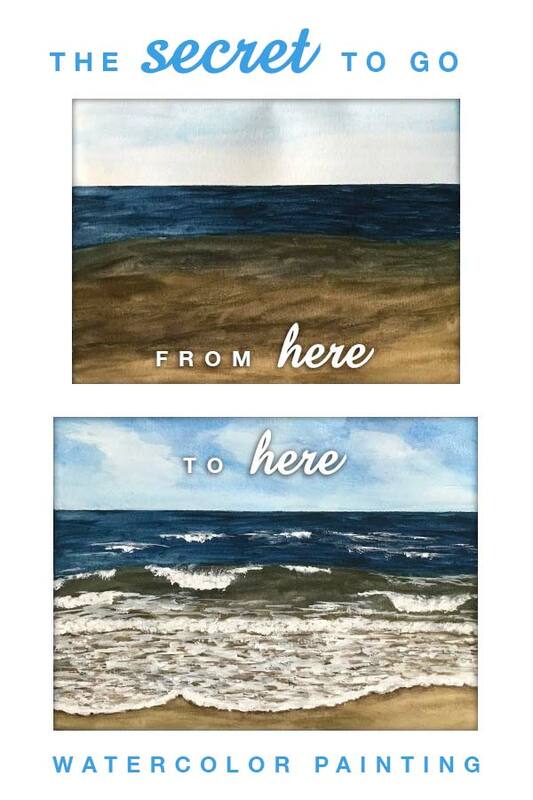 Click here to view my collection of watercolor seascapes. Prints are available on watercolor paper or canvas, in many sizes. Categories: Acrylic, Acrylic seascapes | Tags: acrylic, Difference between, tips, Transition, watercolor | Permalink. In an effort to capture the saturated blue of the sky (with a hint of purple), I had previously used several colors (including cadmium red and ultramarine) and the above was the result. It was too purple, and too dark. It looked like a cloudy day. I didn’t give up. I removed a lot of the paint by wetting it and soaking it up with the brush, and also blotting with a paper towel. Then I added cerulean blue on top. It was this layering of the colors that helped achieve the blue I was looking for. I don’t think the cerulean alone would have worked as well. I also painted clouds and highlights with white gouache. I’ve been using white gouache for the foam of the ocean for a while but only recently have I been using it in my skies. I’m loving the results. Just shows that you gotta push through the ugly stage! View my collection of watercolor seascapes at shop.eileenmckenna.com. Prints are available on watercolor paper or canvas, in many sizes. Categories: painting the beach, Watercolor | Tags: beach, Blue, ocean, Painting skies, Seascape, sky, watercolor, Watercolor sky | Permalink. I’ve learned that creating regularly makes me happy and starting the day by painting sets a great tone for the day. Sometimes I need to create without worrying about the outcome. It’s not always relaxing to sit and create something that you plan on posting or selling. Sometimes I pick something that’s a challenge for me, like painting the shadows and skin tones of a face in watercolor, and I just sit and paint and practice. I do this almost unintentionally to relieve myself of any pressure to perform. When there is no expectations there is no pressure. Have you visited my online shop? Prints of my seascapes are available on watercolor paper or canvas, in many sizes including the new “mini” canvas 11″ x 14″ at shop.eileenmckenna.com. Take a peek! Categories: Watercolor | Tags: painting, Pressure, watercolor | Permalink. 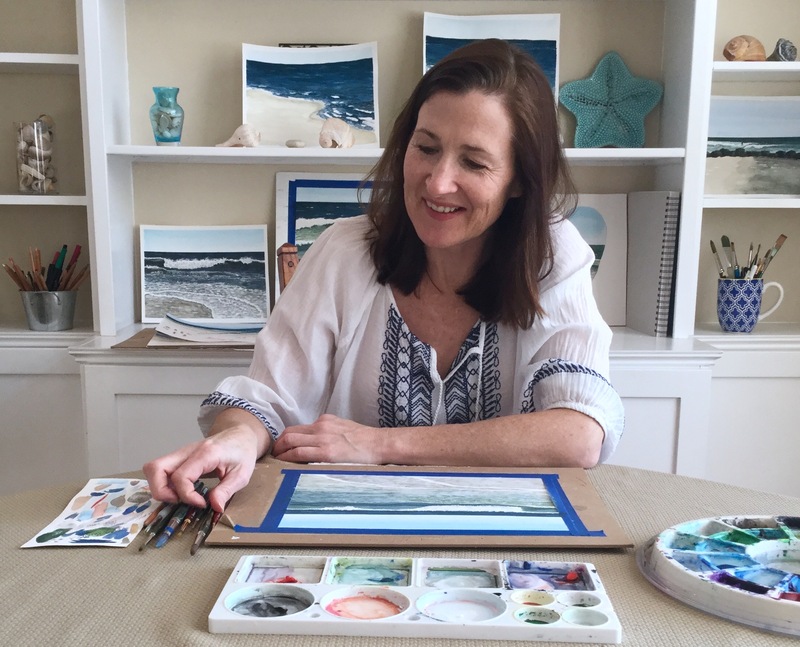 When I first started painting my seascapes, the skies were simple blue gradations, with the lightest blue closest to the horizon. With each seascape painting I started playing a bit more with the sky – trying to achieve the perfect sky blue, adding other colors as a glow on the horizon, adding a bit of texture for clouds. Then I did two painting with gray cloudy skies, which were a lot of fun. Now more often than not, I’m adding colors and texture to my skies, like in these recent paintings. I’m still striving to find the perfect mix of blue for “sky blue,” especially to capture those bright blue sky, summer days. Categories: painting the beach, Watercolor | Tags: Blue, painting, Seascapes, Skies, sky, watercolor | Permalink.